The promising solutions of the Ukrainian defense industry were exhibited for the first time at the AUSA 2017 Annual Meeting & Exposition (the Association of the United States Army) in Washington on October 9, the Ukrainian Embassy in the United States has reported. "The real pride of the Ukrainian stand was a BTR-4 and a remotely controlled Phantom 2 mini armored personnel carrier," reads a report posted on the Facebook page of the embassy. The opening ceremony of the Ukrainian stand was attended by Ukraine's Ambassador to the United States Valeriy Chaly, Director General of Ukroboronprom Roman Romanov and First Deputy Commander of the Airmobile Forces, Major-General Andriy Kovalchuk. 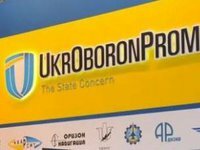 The exhibition showcased the latest developments of Ukrainian arms producers that were tested in conditions of actual military operations in the southeast of the country. The report also notes that "the combat experience of the Ukrainian Armed Forces using Ukrainian technology in real conditions is unique for international partners." AUSA 2017 is a key international exhibition at which participants from different countries present samples of the most advanced military technologies, weapons, and equipment.